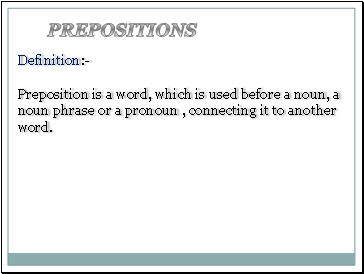 Preposition is a word, which is used before a noun, a noun phrase or a pronoun , connecting it to another word. 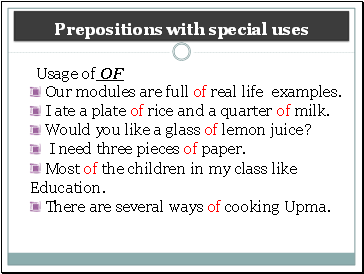 @ Simple prepositions: Prepositions which consists only one word. 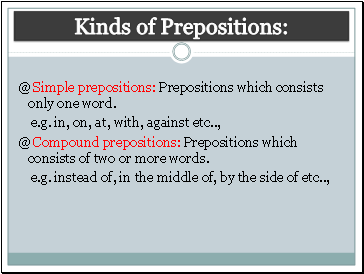 @ Compound prepositions: Prepositions which consists of two or more words. 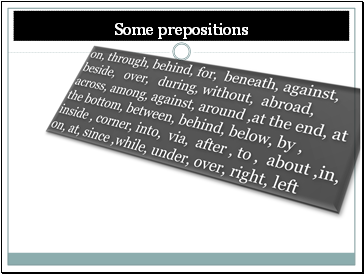 Some prepositions show where something happens. 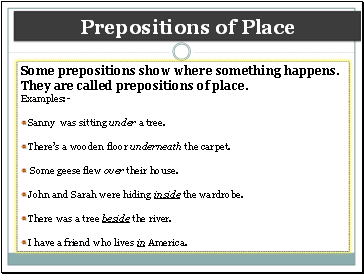 They are called prepositions of place. Sanny was sitting under a tree. There’s a wooden floor underneath the carpet. Some geese flew over their house. John and Sarah were hiding inside the wardrobe. There was a tree beside the river. School starts at nine o’clock. We’re going to the zoo on Saturday. No, you can’t watch a video. It’s past your bedtime already. I visited my grandparents during the summer. You must finish the work by Friday. I’ll do my homework before dinner. 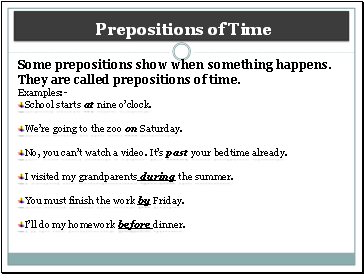 Some prepositions show where something is going. 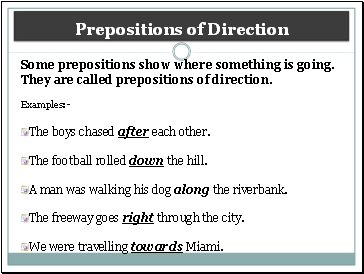 They are called prepositions of direction. The boys chased after each other. The football rolled down the hill. A man was walking his dog along the riverbank. The freeway goes right through the city. We were travelling towards Miami. 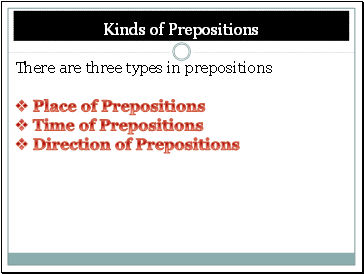 Our modules are full of real life examples. I ate a plate of rice and a quarter of milk. Would you like a glass of lemon juice?